Now that there is a lull in my legal battles, I can get back to blogging about my research. I know that some of you were waiting for the continuation of the Bonded Seraphim series but something tells me that I should take a break from the lattice hypothesis for a little while. Don't worry, I'll get back to it later. It's just that I think that I was moving a little too fast on that subject. Foundational physics is an extremely cool subject but also a very dangerous one that may even be potentially catastrophic for humanity. I am a little paranoid about certain things. Sorry. As many of you know, I've been doing research in artificial intelligence and the brain for many years. The backbone of my thesis is that I believe that the secret of intelligence and the brain is metaphorically encoded in the Bible, especially in the books of Revelation (message to the seven churches of Asia) in the new Testament and the book of Zechariah (Joshua, Zerubbabel, the golden lampstand, the seven eyes of God and the two olive trees) in the old Testament. Artificial intelligence is something that is very dear to me. It is always running in the back of my mind even when I am busy with other things. There is no question that the introduction of true AI into the world would be a very dangerous thing. However, I don't think it would be as dangerous as unveiling the full secrets of the physics of motion and the lattice. In fact, I think that AI may even mitigate the danger posed by future lattice-based technologies. Many years ago, I wrote an experimental chess learning program called Animal. I've been using it as a testbed to try out my ideas in AI. It was originally written in C++ for MS Windows. I have since converted it to C# and changed the graphics code to make it compatible with the Microsoft XNA Game Studio. 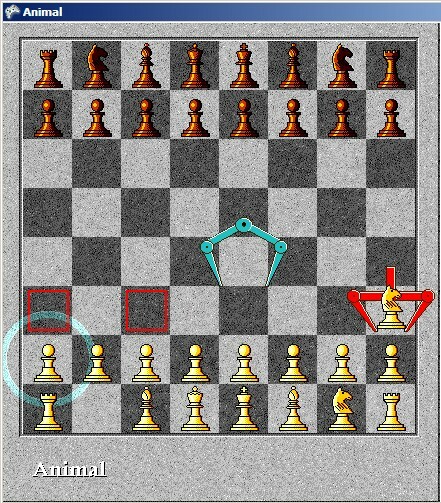 Right now, Animal does not do much other than display a 2-D chessboard and control the user interface. The reason is that I am still conducting research into its brain. The goal is for Animal to learn to play chess pretty much the way a human does, through trial and error. 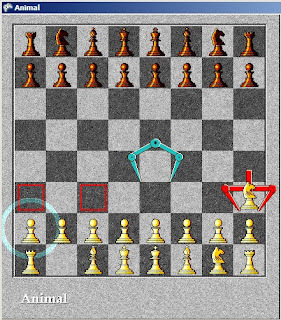 I plan to get Animal's brain to the point where it can learn to play a decent game of chess from scratch, at which point I may sell the game (and possibly even the source code) in order to raise some money for my research. I am working on a multi-part article that will describe the principles behind Animal's brain including the various sensors and effectors that it uses to interact with the board and the chess pieces. Stay tuned. May 2011 be the year of the great revelation, the year that knowledge is increased, chaos is vanquished and all things are restored.